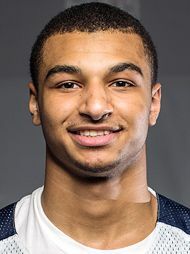 Strengths: Jamal Murray is an extremely crafty combo guard who can score from any area on the floor. Whether he is more of a point guard or shooting guard is still up for debate, but no one can question his outstanding skill set. Murray is very aggressive on offense with the ball in his hands. He is a great attacker and penetrator who can get to his spots on the floor. He is great finishing at the rim, but is also more than capable of pulling up in the midrange for jumpers and floaters. He is also an excellent passer and sees the floor very well. He has range out to the three-point line, especially when he spots up, but can knock it down off the dribble as well. Weaknesses: As was stated earlier, Murray’s true position isn’t quite known at this stage. He has the size to play both positions, but he also isn’t the best athlete. He is not the quickest or most athletic guard and that could lead to some problems, especially defensively. He will have to prove he can guard point guards consistently. He doesn’t have the excellent wingspan to make up for his lack of quickness either. Offensively, he can over dribble at times, especially in the half court. He prefers the ball in his hands and at times can wind up having to force shots at the last second because he pounds the ball too much. Jamal Murray Full Highlights 11.04.2015 Nike Hoop Summit Vs USA - 30 Pts, 6 Ast!